I love coffee! I don’t usually put sugar in, but I have had a serious struggle trying to find a creamer that would work for me. Back in the day I used to love a bit of heavy cream in my coffee. That made it sweet enough without sugar and also made it a beautiful creamy brown color. There are no shortage of dairy free creamers out there–there’s unsweetened and HEAVILY sweetened, there’s almond and coconut–so many choices and I probably have tried them all at one point or another. A month or so ago I came across a dairy free creamer that was labeled half and half. 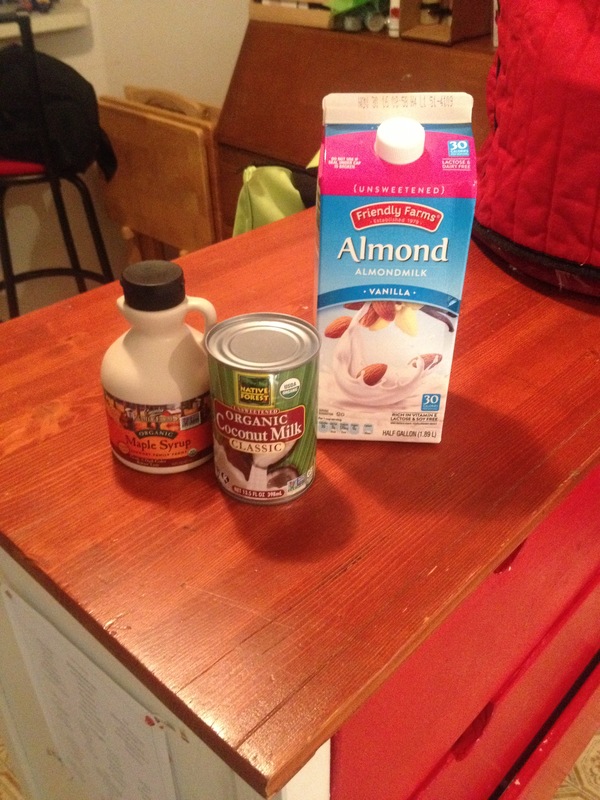 It is made up of half almond milk and half coconut cream. I was intrigued so I bought some to try. It was super awesome–I loved it! The coconut was mixed in so there weren’t weird bits floating in my coffee, there wasn’t a ton of sweetener involved so I felt like I just ate a half-gallon of ice cream…the only problem was when I went back to buy some more…apparently everyone else loved it too because it was out of stock. And still out of stock 2 weeks later! So I thought–this can’t be that difficult. Pour the milks into a container with a tight lid. Add the maple syrup if using. Close the lid and SHAKE WELL! Add to coffee and enjoy! Should keep in the fridge for at least a week, maybe a bit longer. Shake before using EVERY TIME.